2016 Pessoa da Vinha, Terroir Blend, Vinho Verde DOC, Portugal. One of the best values in white wine that I’ve tried this year, this Pessoa Vinho Verde is a savvy blend of Alvarinho, Trajadura and Loureiro grapes, it’s a beautifully crisp and well made wine that way over performs in this price range. Coming off classic terroir in the acclaimed Monção and Melgaço zones, this Pessoa is all stainless steel tank fermented and raised preserving all the freshness and brightness, making this little white a fun and easy vibrant wine that while light and refreshing is not lacking in texture and has an extra degree of depth that you’d expect from a Vinho Verde. 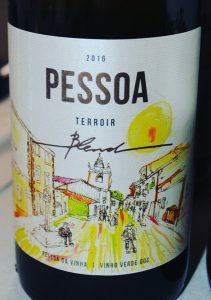 The 2016 Pessoa da Vinha Terroir Blend is brilliant and mineral driven, it has an essence of green apple, zippy citrus and round melon on the palate along with steely delicacy, saline and wet river stones along with hints of tropical elements, lemony herbs and a touch of verbena. I was thrilled by all the wines by Pessoa, the two reds are equally good and full of flavor, but with balance and vitality, even though I think this white delivers a beautiful surprise in quality and style. With air things get even better and more elegant with a lush, smooth mouth feel comes through giving a more serious impact overall, while maintaining it’s lively nature, if this was a California wine, you’d be happy to pay $20-25 for it! I know I’ll be drinking this wine when the weather turns warm and the days grow longer, it will be brilliant for outdoor dinning and especially picnics with fruit and cheese, but with enough substance to go with a good array of foods and cuisines, in particular fresh, briny seafood choices, drink now and often.